The Brachyura, the true crabs, are possibly the most successful of all decapods, with more the 6500 described species in more than 50 families worldwide. 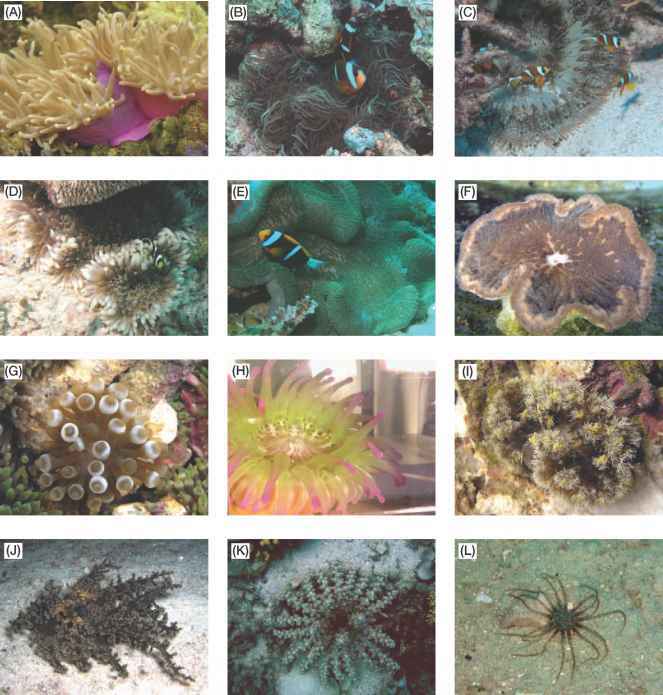 Almost 500 species in about 40 families occur on the GBR. The shallow water crabs of the region are relatively well documented, though many new species continue to be discovered. The name Brachyura, means 'short-tail' and refers to the characteristic feature of crabs—a short abdomen that is tucked beneath the body. Crabs occur in every reef habitat, and some species occasionally enter the water column as hitchhikers on jellyfish or among floating algae or debris. On beaches above the tideline, the fast running stalk-eyed ghost crab (Ocypode; Fig. 23.3/) is conspicuous, particularly early and late in the day. Ghost crabs scavenge and opportunistically prey on whatever they can find on the beach, including the occasional turtle hatchling. Though ghost crabs live high up on the beach, their burrows usually reach down to the water table. On the reef flat, the slow moving xanthoid crabs, such as Actaea (Fig. 23.4A), Atergatis, Carpilius, Chloro-diella, Eriphia, Etisus, and the poisonous Lophozozymus (Fig. 23.3K) are common in and under crevices of coral and rocks. Xanthoids are well adapted to living in and among corals and rock, and are the most abundant and diverse of coral reef crabs. The xanthoid body is typically compact, often covered in small spines, bumps, or bristles, and the legs are relatively short and stout. The claws of many xanthoids have dark fingertips, hence the common name 'dark fingered crabs'. The parthe-nopoids also occur among the rubble of the reef flat, and common genera include Actaeomorpha (Fig. 23.3L) and Daldorfia. Parthenopoids usually have a somewhat triangular or rectangular carapace, with the whole surface of the body and claws covered in tubercles knobs and pits, effectively simulating their rubbly habitat. Unlike the xanthoids and parthenopoids, the swimming crabs (family Portunidae) are fast moving and aggressive. The hind legs of portunids form swimming paddles and the other legs are flattened to assist swimming and digging. The most common swimming crabs on the reef flat are of the genus Thalamita (Fig. 23.4B, C), recognisable by their widely spaced eyes. Species of Thalamita are powerful and aggressive, and can be seen foraging in the open over sand, rubble and seagrass. the soldier crab (Mictyris; Fig. 23.4E), which forages in large numbers on receding tides. Soldier crabs are easily recognised by their somewhat spherical, bluish body, and forward instead of sideways walk. They may march in the thousands, but at the first sign of danger, bury themselves in the sand and mud in a quick 'corkscrew' motion leaving only a small pock mark on the surface where they previously stood. Other conspicuous crabs on the open reef flat include the box crabs (Calappa; Fig. 23.4F). Box crabs hide, buried in the sand, and emerge at low tide to feed on molluscs, especially gastropods. Box crabs are often called 'shame-faced crabs' because the chelipeds are broad and high, almost entirely hiding the mouth and eyes. A peculiar feature of box crabs is a special 'peg-like' tooth on the side of the moveable finger of the right cheliped. The box crab uses this special tooth on the right cheliped like a can opener to literally 'peel' open gastropod shells. Some crabs are very specific about their habitat. 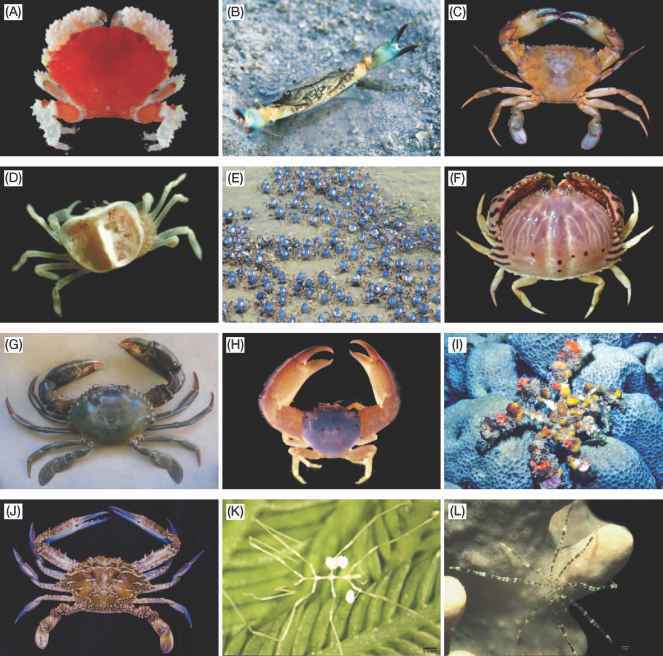 These include the turtle-grass crab (Caphyra rotundi-frons), which lives only in the green alga Chlorodesmis; the swimming crab (Lissocarcinus orbicularis), which lives on and inside holothurians; and coral crabs (Trapezia (Fig. 23.4H) and Tetralia of the families Trapeziidae and Tetraliidae, respectively), which live in the branches of scleractinian corals such as Acropora and Pocillopora. Trapeziids and tetraliids feed mostly on coral mucous, and though not more than 20 mm wide, will attempt to defend their host against intruders including crown-of-thorns starfish (Acanthaster planci). The pinnotherid crabs, commonly called pea crabs, usually make their homes in another type of host, in most cases, bivalve molluscs. Species of Nepinnotheres and Arcotheres are common in pearl oysters, the rare Durckheimia lochi (Fig. 23.4D) lives in file shells (Limidae), and Xanthasia murigera lives in tridacnid clams. Spider crabs (Majidae; Fig. 23.4I) and sponge crabs (Dromiidae) are common on the reef, but they are seldom obvious because they move slowly and are well camouflaged. As their name implies, sponge crabs carry a sponge, held against the carapace by the last two pairs of legs. Spider crabs usually adorn themselves with algae, coral and sponge that are attached to Velcro-like hooked setae; they are often known as 'decorator crabs'. Over time, the sponge, algae or coral grows over the surface of the crab to the extent that the crab can hardly be detected unless it moves. As a small, mobile piece of 'reef', other hitchhikers including worms, amphipods and even other small crabs can be found on large majids. Numerous species of crabs occur on the soft sediments between reefs, particularly swimming crabs of the genera Charybdis and Portunus. Among these is the edible blue swimming crab, Portunus armatus (previously known as P. pelagi-cus) (Fig. 23.4/) and mud crab, Scylla serrata (Fig. 23.4G).